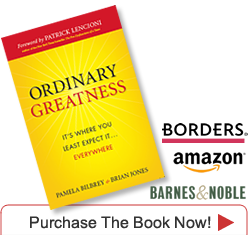 In this space, we would like to profile “Glimpses of Greatness,” the stories of people who bring the “Ordinary Greatness” principles to life and have used them to achieve success. We can think of no better story to begin “Glimpses” than that of Margot Fraser. Margot’s story was profiled in the June 2009 issue of Inc. magazine http://www.inc.com/magazine/20090601/how-i-did-it-margot-fraser.html, and she is amazing! Margot is the founder of Birkenstock USA. You are probably familiar with the ubiquitous sandals and the amazing loyalty the wearers of the sandals have, but you may not know the story of the lady who brought the sandals to America. Margot was an only child living in Berlin during World War II. Her father was able to somehow get the family out of Berlin six months before the war ended, and she eventually found her way to Canada. She became interested in natural health, and in 1966, with her husband, she went on a tour of German health spas and manufacturers of supplements and vitamins. Undeterred, Margot displayed the shoes at a convention of health-food store owners. It took a few years, but of course, the sandals really took off, and sales improved every year until the 1980’s when with “dress for success,” sales went flat. Sales improved, and the employees remembered Margot’s loyalty to them. She knew that the key to taking care of customers was taking care of employees. Margot Fraser is a tremendous example of Ordinary Greatness. She was a girl from a war-torn country with a product no one wanted at first. She didn’t listen to the naysayers – instead she found a way, built a great company, and gave it back to the employees. She is a living example that greatness can be found where we least expect it: everywhere!